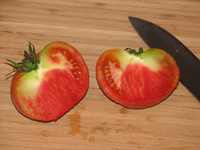 The Brandywine tomato is a popular Amish heirloom tomato known for its rich tomatoey flavor and is always a top finisher in taste tests; it was one of the top 20 best-tasting varieties in the Feb/Mar '08 Mother Earth News, for example. This widely grown variety has a cult following even though it is one of the slowest growing with a maturity of 80 to 90 days. It is an indeterminate that needs to be staked or caged. Its reddish-pink fruit are large with an average size of 12 ounces, but can grow as large as two pounds! The Brandywine can be challenging to grow as it can be prone to diseases, uneven ripening, and cracking. 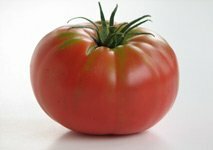 I recommend buying Brandywine tomato seeds at TomatoFest because not only do they specialize in heirloom tomato seeds that are certified organic, but their service is great and their staff friendly.